Providence, RI (11/19/2012): "WaterFire: The Art & Soul of a City, How a Work of Art Transformed Providence," presented by Cardi’s Furniture, will be shown at a Premiere on December 1, 2012. This special one-night only event will be held Dec. 1 at Veterans Memorial Auditorium in Providence. Two-time New England Emmy award-winning Executive Producer and former television sportscaster Joe Rocco, in cooperation with WaterFire creator and award-winning sculptor Barnaby Evans, isleading a talented team of broadcast professionals to produce this compelling documentary that will be presented in brilliant high definition. WaterFire has captured the imagination of more than 15 million visitors, gaining national and international attention. This one-hour documentary takes viewers behind the scenes of WaterFire Providence, with its sparkling bonfires and enchanting music. How did it start? How does it happen? Who are the people who make it happen? It is all covered in this documentary along with the rich history of this popular 18 year-old spectacle. Barnaby Evans will be profiled and talk about his initial vision for WaterFire, where it has been and where it is headed. Commentary from WaterFire officials, participants, professors of art and architecture, local historians, government officials and fans from around the world are included. The program also takes viewers to Rome, Singapore and other cities where WaterFires have taken place. Fifteen-time New England Emmy award-winning videographer and editor Jim Karpeichik is the chief videographer and editor of this documentary. Rocco and Karpeichik combined their talents most recently on the New England Emmy Award-winning television special, When the Reds Ruled the Roost, the story of a love affair between the immensely popular Rhode Island Reds hockey club and their passionate fans. That program aired on NBC 10, NESN, Rhode Island and New Hampshire PBS. The WaterFire Premiere will be hosted by WPRI 12 Rhode Show hosts Michaela Johnson and Will Gilbert. Evans and Rocco will also be on hand to talk about the documentary after the screening. Many other local celebrities, including former Providence Mayor and AM 630 WPRO’s Buddy Cianci will also attend. Tickets and VIP packages, which include a pre show celebrity reception with heavy hors d’oeuvres and open bar on the Vets stage, are available at the PPAC Box office, the Vets website, or by calling 401.421.2787. 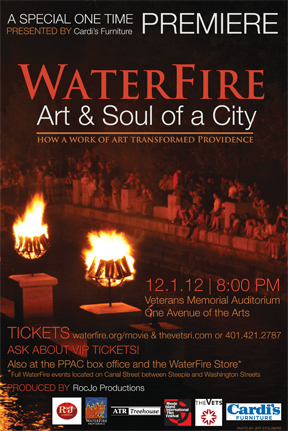 For more information on WaterFire: The Art & Soul of a City, contact Joe Rocco at 508. 336. 5818 or JoeRocco@Comcast.net. Visit www.waterfire.org/the movie for a preview.